Author, screenwriter, producer, and director Michael Crichton would have left an incredible legacy even if the only sci-fi works associated with him were Jurassic Park and Westworld (and their many sequels and related titles). But he had so many more movie and TV credits to his name. Crichton, who died in 2008, did plenty of non-genre work, of course – he created medical drama ER, which ran for a staggering 15 seasons on NBC. He also, for instance, wrote and directed the Sean Connery-Donald Sutherland period crime drama The Great Train Robbery, and produced The 13th Warrior, a Norse-mythology-meets-Antonio-Banderas (cast as an Arab man, which was apparently an OK thing to do in 1999...) adventure based on Crichton’s historical fantasy Eaters of the Dead. Just to name a few. But beyond his resurrected dinosaurs (still raking in billions as the Jurassic World trilogy continues) and killer humanoid robots (both in 1973's Westworld and the current HBO series), here are nine other sci-fi movies with Crichton’s DNA in them. You’ll notice many of them share the author’s signature themes, like technology that runs amok and science that gets way weirder than anyone intended. Does the ever-entertaining Twister, released 23 years ago, still count as sci-fi? At the rate we’re going, concentrated outbreaks of massive tornadoes will be the climate change-spawned norm, rather than some incredible phenomenon that sends rival teams of weather nerds racing with glee and terror through rural Oklahoma. Crichton and his wife, Anne-Marie Martin, co-wrote the screenplay; their relationship no doubt helped inform the separated-but-still-obviously-in-love couple played by Bill Paxton and Helen Hunt. Crichton also co-produced the film, which was made by Stephen Spielberg’s production company, Amblin – and you can’t help but hear Jurassic Park’s dinosaurs every time one of Twister’s funnel clouds starts improbably, but hilariously, growling and howling at the puny humans in its path. Crichton wrote and directed this 1984 thriller, which stars Tom Selleck at the height of his Magnum, P.I. fame as a vaguely futuristic cop on the “malfunctioning robots” beat. One day, his job shifts from glorified repairman to something way more dangerous when a domestic robot’s cooking, cleaning, and door-answering skill set suddenly expands to include cold-blooded murder. Technology out of control? Where have we seen that before? In this instance, at least, there’s a villainous human hand directly controlling all of the machine mayhem. Runaway is not a particularly great movie; it does things like heavily foreshadow its dangling-off-a-skyscraper climax by reminding us over and over again how much Selleck’s character hates heights. But its vintage special effects (those deadly li’l robot spiders! ), synth score, and cast – especially a glowering Gene Simmons as the movie’s evil-inventor antagonist, though Kirstie Alley and Cynthia Rhodes (pre-Cheers and pre-Dirty Dancing, respectively) also add mid-1980s interest – make it a fun-in-retrospect slice of classic Crichton. Crichton directed and adapted the screenplay from Robin Cook’s best-seller for this 1978 medical thriller. It has some things in common with Looker – it’s also about a doctor (here, played by Geneviève Bujold) who becomes suspicious when patients undergoing seemingly routine procedures at her hospital start falling into deep comas and being declared brain-dead. Much like Twister, it’s a bit of a stretch to call Coma sci-fi, although some creepy technology involving remote-controlled poison gas does go into the illicit coma-inducing. When the doctor eventually realizes the lucrative black-market organ trade is to blame, Coma leaps from paranoid freak-out into gruesome body-horror territory. The cast overall is outstanding, with Michael Douglas, Rip Torn, and Richard Widmark playing hospital colleagues good and evil; future Runaway star Tom Selleck as a victim; and a young Ed Harris making his big-screen debut as a helpful pathologist, several decades before his chilling turn on HBO’s Westworld. Barry Levinson’s 1998 undersea sci-fi thriller is based on Crichton’s 1987 novel, and it has maybe the most impressive cast of any film on this list: Dustin Hoffman, Sharon Stone, Liev Schreiber, Peter Coyote, Queen Latifah, and Samuel L. Jackson (whose career had picked up rapidly after his turn in Jurassic Park, mostly thanks to 1994's Pulp Fiction). And, well, the cast is about the best thing Sphere has going for it. After what appears to be a 300-year-old alien spacecraft is discovered deep beneath the ocean, the U.S. military corrals four experts to investigate and maybe even make contact. But what starts off as a pretty weird mission gets even stranger. As a dangerous typhoon closes in topside, the group realises that it’s not an alien ship, but an American craft that apparently travelled way back in time through a black hole – though it is carrying a large floating sphere that appears to be controlled by a vaguely malicious intelligence, but soon reveals itself to be much freakier than that. Too bad it’s not enough to elevate Sphere into truly suspenseful, scary, or even original territory; the film’s main distinguishing characteristic, other than all those A-list actors, is how talky it is. And somehow, even with all the explaining and discussion, the story still doesn’t quite make sense in the end. Mike Hodges (Get Carter, Flash Gordon) directed and adapted this 1974 film based on Crichton’s 1972 novel. It’s about a genius computer scientist (played by George Segal) who suffers from seizures that cause him to unknowingly commit acts of violence. Desperate to cure his out-of-control homicidal urges, he agrees to a radical new procedure that will install electrodes on his brain and zap him whenever a seizure starts to strike – despite his nagging (and, as it turns out, prophetic) dread about letting a computer take control of his mind. Though The Terminal Man struggled to connect with audiences, it did have some high-profile fans, notably directors Terrence Malick and Stanley Kubrick. Crichton’s 1999 novel formed the basis of Richard Donner’s 2003 adventure about a group of archaeology students who must teleport through a wormhole to rescue their professor (Billy Connelly), who’s trapped in 14th century France. Of course, things get just a little complicated once they find themselves back in 1357. A mop-topped Paul Walker, as the professor’s kid, gets top billing; Gerard Butler (a few years pre-300, with his Scottish accent turned on full blast) is third-billed but actually ends up with the most important role, playing a scruffy historian who falls in love with a rebellious noble (Anna Friel) – and then stays behind to make sure time-travel shenanigans haven’t ruined the future everyone else is trying to return to. Timeline is amusing enough, but it takes itself just a touch too seriously – and its cast has so many characters it’s hard to get invested in anyone’s fate. But perhaps worst of all, its conflicting plot threads of “eggheads with clashing agendas in the present day frantically trying to repair their wayback machine” and “eggheads in the past trying to outsmart a medieval army” make for some awfully jarring transitions. Crichton wrote Congo in 1980, and though he hoped to shepherd it to the big screen himself, it didn’t get adapted (by John Patrick Shanley) into a movie (directed by Frank Marshall) until 1995. Obviously some of that was due to Jurassic Park fever (the OG JP came out in 1993), but also because of the special effects necessary to visualise Congo’s story, which prominently features a talking, martini-drinking gorilla named Amy (played by an actor in a furry suit that was surely cutting-edge 24 years ago). Congo wasn’t entirely well-received at the time of its release (it was showered with Golden Raspberry nominations, though it had the good fortune to be released the same year as Showgirls), but if you approach it knowing that it’s truly a throwback B-movie masquerading as a big-budget adventure, you’ll be surprised at how stupidly fun it is. When a Congo expedition funded by a communications company (and led by Bruce Campbell!) gets slaughtered while searching for a rare blue diamond, which they need for laser-related purposes, a rescue party of one (Laura Linney, who adds some gravitas) follows their trail, looking for answers. 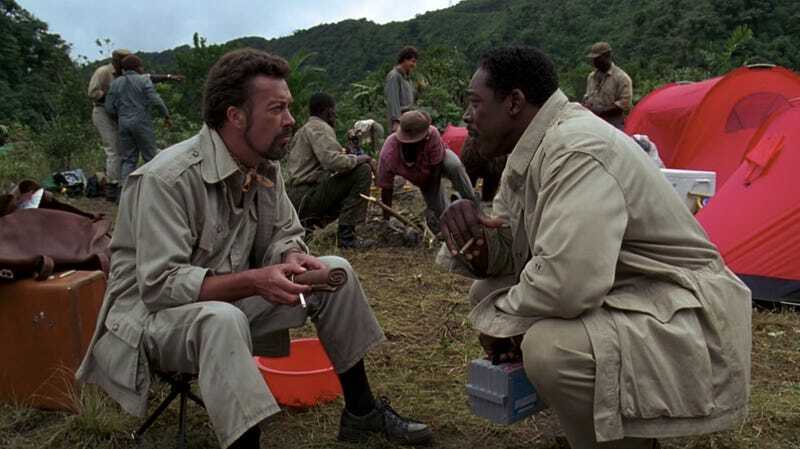 Along the way, she meets an earnest primatologist (Dylan Walsh), a swaggering guide (Ernie Hudson), a warlord (Delroy Lindo), and a treasure hunter (Tim Curry doing a hilariously theatrical Romanian accent), as well as the previously-mentioned Amy (who really does talk, and trash-talk, using a high-tech electronic voice), and a pack of extremely badass jungle creatures who can only be described as “guerrilla gorillas.” Oh, also, there’s a greedy corporate boss (Joe Don Baker), cameos by Joe Pantoliano and James Karen, a questionable “tribal ritual” scene, parachutes, a sing-along, a hippo rampage, laser guns, and a massive volcanic eruption. With all that, who needs robots or dinosaurs? Jurassic Park and HBO’s Westworld aside, maybe the most-praised Crichton adaptation is this tense 1971 thriller, directed by Robert Wise (The Day the Earth Stood Still, Star Trek: The Motion Picture, The Haunting, The Sound of Music) with a script by Nelson Gidding. (Crichton’s 1969 novel also inspired a 2008 A&amp;E miniseries co-produced by Ridley Scott, which offered an updated take on the original story.) Considered to be one of the early standouts of the “killer virus” genre, The Andromeda Strain begins as a satellite carrying some kind of deadly-to-humans “space germ” crashes down in New Mexico. An elite team of military scientists (one of whom is played by Arthur Hill, who later co-starred in 1976 Westworld sequel Futureworld; my favourite, though, is the snarky doctor played by Kate Reid) frantically works to study the malevolent organism deep within Wildfire, a fortified lab that’s set to self-destruct using nuclear means if there’s a containment breach. Only one key exists to both start and end the self-destruct sequence, and it’s foisted upon the sole unmarried man on the team...setting up the film’s climactic race against time to stop a worldwide biological catastrophe. The Andromeda Strain taps into fears that the space program (which was then at the height of its moon-landing era) might accidentally bring something alien and dangerous back to Earth, while also preying on Cold War-era paranoia about nukes gone wild. But the most fascinating thing about the movie might just be its production design, particularly when the story shifts almost entirely into the lab – a sleek, shiny, high-tech (for 1971) underground bunker that makes use of both all-white interiors and brilliantly monochrome rooms, and is so isolated the humans that populate it might as well be in outer space.